I can’t believe I got this post done EARLY! I have been so busy and slacking on the Saturday stuff! Well its Saturday. My most LOVED day of the week 😀 Thanks for stopping by to join me in celebrating today. Well I guess technically we should really celebrate everyday we wake up, shouldn’t we? There is something good in every day. So think about what is in your own life that is good. Now every Saturday I host a sketch challenge here on my blog. This week I decided that we would use one of My Timeless Templates © for the sketch instead! Today’s “sketch” will use Stocking Stuffer © Keyword will be mytimesstuffer if you upload to a online gallery. Now this isn’t a template you have to PURCHASE, it was part of the Freebie downloads, so there are NO excuses 😀 If you have been putting off trying the templates, or already downloaded, but procrastinated making something, then KNOCK IT OFF! LOL! Procrastination is a BAD thing. Get crackin. If you haven’t downloaded YET please read the INSTRUCTIONS!!! You also want to make sure that your Page Scaling section when printing is set to NONE. You may also check the Q & A section I have HERE. Now don’t feel limited by the “stocking stuffer” name. You will receive an Idea Catalog when you download , with 5 exclusive ideas (non-holiday :D) to use this template for. So get creative. That should get the ideas flowing. You can also view all my own template creations HERE. Is this not adorable? 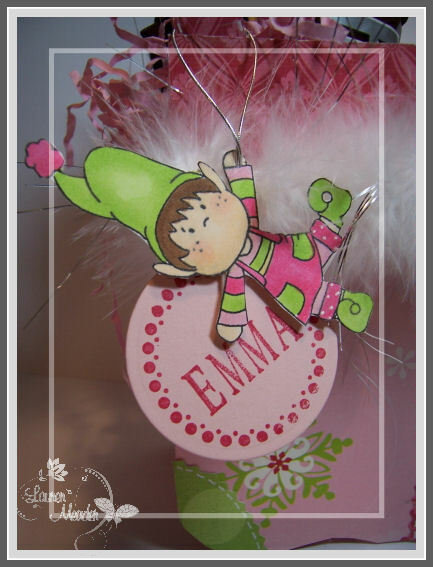 When I saw the position of the lil elf in SugarPlums North Pole set I thought how cute would that be hanging from MY stocking template?! So I jotted down my idea in my creative notebook to pull out when I had more time or needed a great gift idea. You never want to forget a good idea when it hits. I have lots of that stuff jotted down in hopes to get to it, someday! I loved that holiday paper by SEI. Its so pretty, and it is double sided, so perfect for my template 😀 It also inspired my colors. Now Amber is in Ballet class, and the girls swap a gift with a classmate. It just so happens she got her little BFF Emma! (I wonder if that was rigged by the dance teacher? :D) Now the monetary limit is $5 per girl and it is important that be stuck to. Don’t want anyone feeling awkward. I don’t know about you, but gift packaging where I am ALONE can cost that! Well I decided I would make the most of it, and create an UBER cute Stocking Stuffer © package, and STUFF it to the tipity top with fun stuff from the Target $1 spot. Then how fun to personalize it too 😀 Gotta love being a stamper. I used my JustRite Stampers circle border and alpha from the Two Monogram Stamper Kits (Normally not sold together but) I about fell over when I saw the deal……………………. JustRite Stampers is having a Thanksgiving Buy one Get one FREE! Sale!!! Details HERE! Sale ENDS on the 30th! Back to the template details- I printed my template and for the heel and toe patches I used pinking sheers to trim down the design a bit on the heel. That is what I mean by taking creative liberty. Don’t be afraid to change something up to suit your design. White gel pen used for faux stitching. I also rounded the top corners of the stocking cuff. After it was all assembled I added some furry white trim stuff I got at Michaels for that little extra holiday UMPH! Loving that stuff too. I know Amber was mad I put Emma’s name on it because SHE wanted to keep it for herself 😀 That made mommy feel so good. Plus getting a huge leap on these Holiday TO DO’s is always nice too. Never too early. I hate running like a mad woman close to Christmas. It takes away all the JOY of the season. So that is all for me today. I have many more things to follow, so stay tuned. 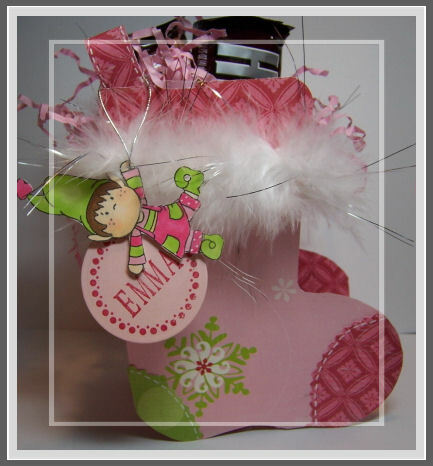 Be sure to check in on my Sketch Team to see what they have created with the Stocking Stuffer Template. Now it’s YOUR turn! Send us a link here, to wherever your fabulous creation is posted, so we can all check and see what you did.